Tiago Melo's AZOUGUE NAZARE is a one of a kind must see. 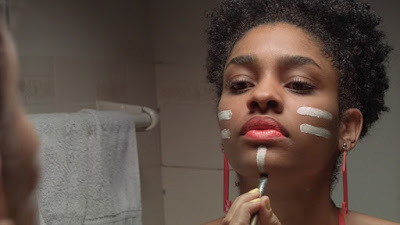 A clash of cultures between Maracatu, an Afro-Brazilian burlesque carnival tradition and Christianity the film is wild and alive something truly special. Centering around a couple where the wife is a Christian and her husband is not so much, preferring to partake in the madness of Maracatu. It's kind of hard to day more than that because in it's way this mix of styles and genres is hard to really hard to fully explain. With moment of song, dance and even the supernatural, Melo's film doesn't feel acted as much as lived in. We are watching a controlled documenting of life unlike any other. To be honest in trying to come up with a way of talking about the film I read several reviews which talked about the traditions behind what we see and other bits that fall outside of the film. It is almost as if they, like I, were unable to fully put words together to discuss the film. To that end all I can say is just buy a ticket and take a ride.